Even something as innocent and energy-saving as an LED light bulb isn’t safe from myths and misinformation out there on the internet. It’s true that more and more people around the world are appreciating the efficient benefits of LED lighting, but the LED lighting experts here at New Edison Lights feel that it is necessary to shed light on these myths. That way, our readers can have a clearer picture (or brighter, should we say) of how LEDs work. While LED lighting is an incredible feat of electrical engineering technology, it’s important to have a realistic and accurate understanding of these lights. Our commercial LED lighting experts are out to save your business time and money by bringing you cost-saving lighting design solutions in Longmont and the greater Front Range area. By representing businesses as opposed to lighting manufacturers, New Edison Lights can help you maximize local utility rebates. Schedule a lighting audit today to learn more! LED light bulbs are certainly bright enough – in fact, they’re almost always as bright or even brighter than conventional incandescent bulbs. The main difference with LED light bulbs is that they use far less energy. If you compare an average 7W LED bulb and pit it against a 60W traditional light bulb or even a 12W energy saving stick, what you’ll notice is that the standard LED bulb is just as bright as the competition, putting out the same number of lumens. This is not true – LED bulbs do give off some heat, but significantly less as compared to energy-saving sticks, twisters, and traditional incandescent light bulbs. What’s even “cooler” about LED bulbs is that when used in your light fittings at home, they don’t emit any infrared (IR) light. Instead, LEDs just emit visible light. The problem with infrared light emissions from light bulbs is that they don’t actually add to the useful brightness of the light, rather, IR just makes bulbs hotter, burning innocent hands and wasting energy. Another plus is that LED light bulbs don’t emit ultraviolet (UV) light, either. Yet another win for LED lighting technology! It is true that the initial cost of a LED light is higher than that of a traditional light bulb, you are guaranteed to save money in the long term. Indeed, the initial investment is more than paid back over the life of the bulb because the running costs are lower. Plus, LED light bulbs don’t need usually need to be replaced for a very long time after they’re purchased – some last up to around 15 years depending on the frequency of use. 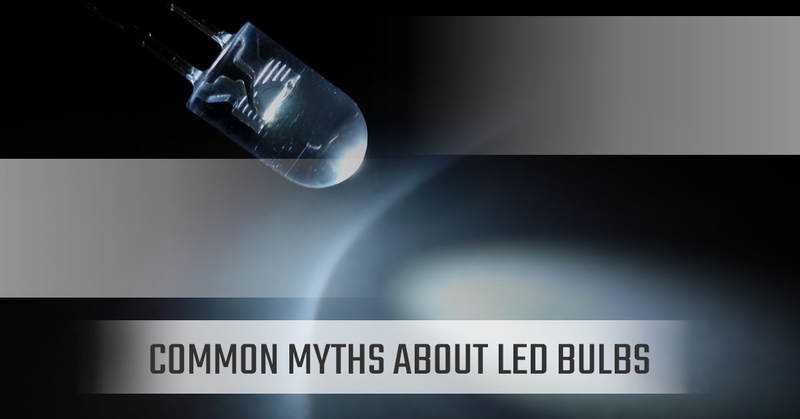 Stay Tuned For More LED Myth Busting From New Edison Lights! There’s a fair amount of misinformation about LED light bulbs, so check in with our commercial LED lighting company to learn more! In the meantime, discover how our commercial outdoor LED lighting solutions and new LED lights can help you save money by getting in touch with us.